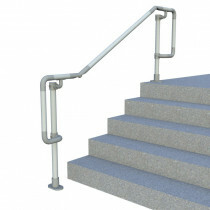 Simple Rail stair railing kits are easy to install, can withstand harsh outdoor environments, and will keep you safe for decades. Choose from our extensive list of surface and wall mounted railing kits. 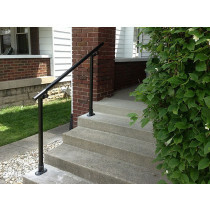 A simple ground mounted handrail that has a smooth surface and durable flat black powder coating. Smooth - Fittings do not wrap around the grab rail. Easy - Pipe drilling required. Pipe cutting may be required. 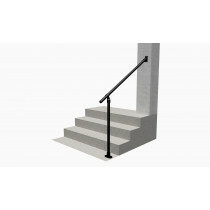 A simple ground and wall mounted handrail that has a smooth surface and durable flat black powder coating. 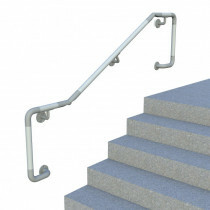 An easy to install, ground-mounted railing for your narrow stairs and landings. This kit uses slip-on fittings and ADA compliant returns on the ends. 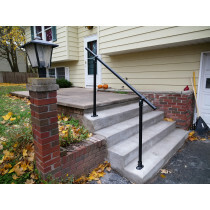 An easy to install ground mounted railing for your stairs and landing. This kit uses slip on fittings and has open ends. Slip-On - Fittings wrap around grab rail. Easiest - No pipe cutting or pipe drilling required. 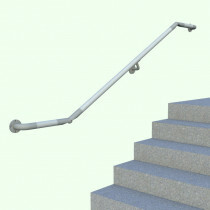 An easy to install ground mounted railing that uses slip on fittings and has open ends. 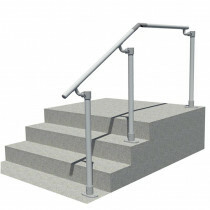 An easy to install ground-mounted railing that uses slip-on fittings and has open ends. A simple ground mounted railing that has a smooth surface and open ends. This railing attaches to a wall or post on one end and an upright on the other end. This railing can be used at any angle and has an open end. This railing attaches to a wall or post on one end and an upright on the other end. 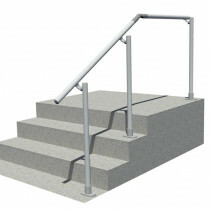 This railing can be used at standard stair angles and terminates into the end post. This railing attaches to a wall or post on one end and an upright on the other end. 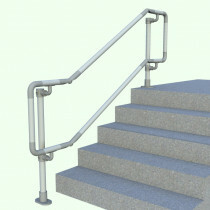 This railing can be used at standard stair angles and has an open end. 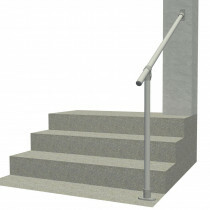 A simple ground mounted railing that has a smooth surface and terminates into the posts. This railing attaches to a wall or post on one end and an upright on the other end. 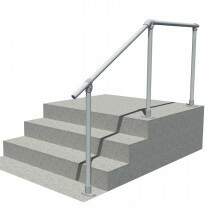 This railing can be used at any angle and has open ends. Smooth surface wall mounted railing the curves back into an existing wall or post. Open ended wall mounted railing that mounts to an existing wall or post. ADA railing kit to simplify the installation of an ADA compliant railing. This railing mounts to uprights and has a top rail and D-returns on the end. Medium - Pipe drilling required. Pipe will need to be cut to fit on site. Open ended, smooth surface wall mounted railing that mounts to an existing wall or post. 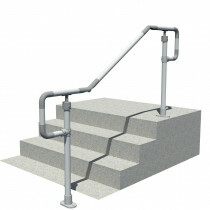 ADA railing kit to simplify the installation of an ADA compliant railing. 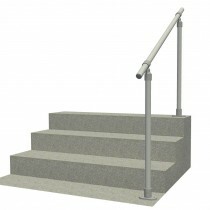 This railing mounts to uprights and has a top and middle rail and D-returns on the end. 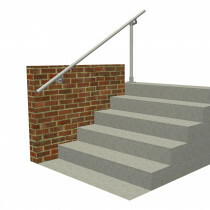 ADA railing kit to simplify the installation of an ADA compliant railing. This railing attaches to the wall and curves back into the wall or post at the end. 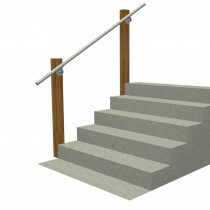 ADA railing kit to simplify the installation of an ADA compliant railing. This railing attaches to the wall and has full D-returns on the end.